This wooden Irish nutcracker is holding an Irish Tri-Color flag and shamrocks. This hand-painted Irish Nutcracker Figurine has a Functional Jaw. 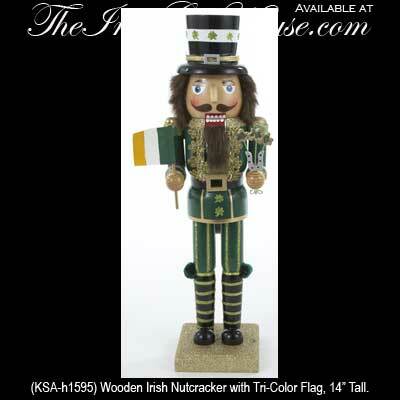 Irish Christmas - Wooden Irish Nutcracker with Irish Tri-Color Flag and Shamrocks. Made of Wood, 14” Tall, Gift Boxed. This hand-painted Irish Nutcracker features an Irish Tri-Color Flag and Shamrocks!